This program follows Union Pacific #844, as it powers The Little Rock Express. Former head of the UP Steam Operations was the well-known Steve Lee. Mr. Lee had retired in 2010. Fans chose a route for an 844 excursion with online voting. The winners were a roundtrip from Nebraska to Little Rock, Arkansas. This event was exciting for steam enthusiasts. In June, 2011 the train ran the route. Diverging Clear sent two camera crews to chase the special in Missouri and Illinois. This was on ex: Missouri Pacific trackage. A fast moving train, gave them a challenge. The story begins in Kansas City, with 844 get a bad bearing sidelined, with the repair. Once underway, the action begins in earnest. There are some brief pauses within the story. This is a lively show of the steam locomotive, in action. Quickly, we are viewing the locomotive working in the MoPac mainline. The special is headed to Jefferson City, MO. If your friends should ask, that is the state capitol. There are on screen graphics that denote the scene locations. There are a multitude of locations in this nearly one hour show.There are no maps in this show. The main menu is a push play type. No chapter menu either. A hidden chapter selection can be accessed using the next button control. Extras contains previews of other DCVP releases, and those have chapter style menu selection. Kevin Payne is a radio announcer, and narrates this program. He provides the information as we journey towards Little Rock, Arkansas. He doesn’t overstep the classic engine, with those lovely sounds of steam. The script is direct and to the point. Kevin sounds fine, as he sojourns with us on this trip. The viewpoint is current, and focused on the 2011 trip. Natural, environmental audio is the main soundtrack. As the live sound goes, it is very good. You will hear some wind noise on occasion. This does not detract from the pleasurable viewing. In wooded areas, birds and crickets are heard. Crossing dingers are also part of the sounds. Of course, the locomotive is frequently the centerpiece of the audio track. I do find some commentary a bit amusing, regarding ‘large crowds’ etc.. If you have seen the 844, in the midst of a crush, of hundreds of onlookers, you will know what I mean. The special is seen at many locations along the route, as it traverses the Missouri countryside. As the train speeds down the track, you know there is quite a chase involved. The second day finds the Little Rock Express arrival in St. Louis. The Union Pacific has a specially painted Heritage Diesel tucked in behind 844. It is a Missouri Pacific SD70AC and commemorates the route being used here. The train travels into southern Illinois on the following day. This trackage is the Chester subdivision, on Union Pacific now. Mississippi River scenes are nice to see. Heavy rains have turned some fields into ‘river scenes’. The openness of the land results in wonderful, panoramic views of the train. Watch for the crossing gate that is protecting the river. A strange sight indeed! We are on BNSF at Cape Girardeau, Missouri and going to Arkansas. A BNSF frieght move is ahead of our train. A few UP freights make brief appearances on UP rails. Interesting to see, the 844 train makes a reversing move. The excursion is going back onto company rails. A smart decision to capture, and include this uncommon view on film. The express travels through Arkansas. A little heavy on the ‘ding-ding’ scenes on the return. The flooding has worsened, and some modifications are made to the schedule. We pickup again in Kansas. The special is now on the return portion. Union Pacific 844 continues onward. The train is last seen in Nebraska. Here the chase ends. The Little Rock Express continues heading to it’s conclusion at Council Bluffs. Would have liked to have seen the final destination at Council Bluffs. Also, what about Little Rock? Did the floods prevent that destination? That is one area, the story is vague. Still, they are consistent with the advertised show. Just would have rounded out the film. The producer has informed me, the rising floodwaters led to an early departure of 844 from Little Rock. We are all aware that Mother Nature cannot be controlled. The camera crew arrived at Little Rock, and there was no train in sight! Well, at least you readers have the accurate story. Like many of us, we have all missed a train or two, over the years. In effect, it becomes a trade-off event. The unusual high waters are included, in a rather rare occurrence, for an excursion train. In exchange, Little Rock is not seen in the show. The hour is just about right, to see the train in the many locations on the route. As many 844 shows are in Western states, this material offers a look at this Midwestern operation. Cinematography is well done. Clear imagery and again, those multiple pan shots are sweet! Overall, this is a basic railfan video. Not a fancy presentation, but a pretty solid one. It does present a comprehensive overview of the middle sections of the roundtrip. Suitable for women and children too. This show runs smoothly. Diverging Clear Productions has 844 in a good, quality production. Fans of steam locomotives get much action, in this nicely paced show . The 844 fans will find The Little Rock Express, a worthy addition to their collections. 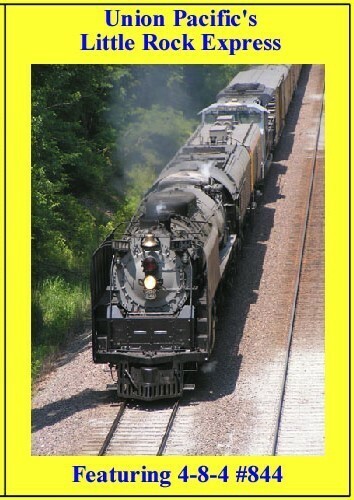 This entry was posted in ATVR Reviews, Diverging Clear Productions and tagged American Train Video Reviews, new releases, Railroad, steam train, Train DVD, Union Pacific by William J. Hudson. Bookmark the permalink.